Without a doubt, day one was the one full of new announcements for the typical consumer, days 2 and 3 were more about technical presentations for developers interest. An important annoncement we didn’t talk about before was Google Music All Access, which pretends to compete with Spotify, it´s actually only avaliable in the US, and its going to offer an unlimited access for USD 9.99 per month. – Google Play Games, as an important platform for developers. – Google Wallet integrated with Gmail so people can send money by email… sound interesting, but safe? – Google serach now has voice recognition, they think about it as a more personal interaction, I praticularly think, it’s going to be a social revolution if we talk about inclusion. – Google Glasses, expecting to get more popular with new applications. There are some magazines now preparing to offer special features with them. – And of course, Google Music All Access, we talked before. As Larry Page said, they are only at the 1% of they are capable of, for sure Google is going to surprise us more in the near future! 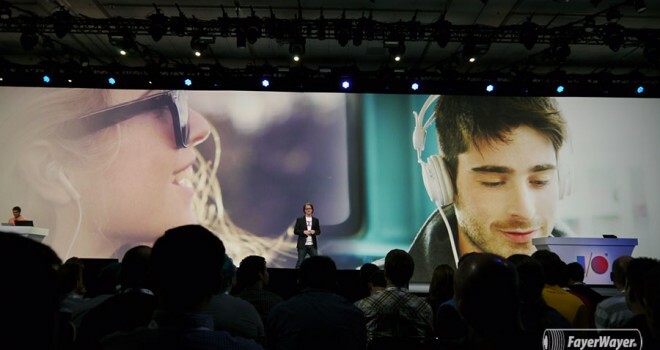 This entry was posted on May 19, 2013 by jmarinsi in News and tagged Google, Google Glass, Google I/O 2013, Google+ Games, Hangouts, Music all Access.